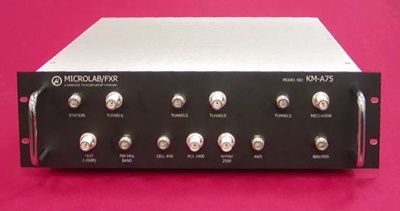 Announcing an expansion of frequency bands and facilities now available on its wide range of Combiner Boxes. Used for combining transmit and receive wireless signals in building DAS (Distributed Antenna Systems) and transportation systems, these boxes minimize loss and Passive Intermodulation, (PIM), with the careful application of filters, hybrids, low PIM loads and other passive components. The unit shown combines signals from the 700 MHz, Cellular 850, iDEN, AWS and WiMAX bands. These are then split to six outputs and a test port for distribution to different areas of the wireless coverage system. Such Combiner Boxes are available for immediate evaluation from Microlab/FXR and selected distributors. For complete details call 'Sales' at Microlab/FXR on (973) 386-9696 or check the Internet at www.microlab.fxr.com.